Our visit to Quartzsite was something of a bust. With Eleanor sick most of the time, we didn’t get out much, and on the last couple of days when she started to feel better, the temperature plummeted. With the ever-present breeze, a sunny day in the 50s felt pretty cold. Being weak from not eating for a few days, Eleanor was not equipped to go hiking in the Kofa Mountains in cold weather. 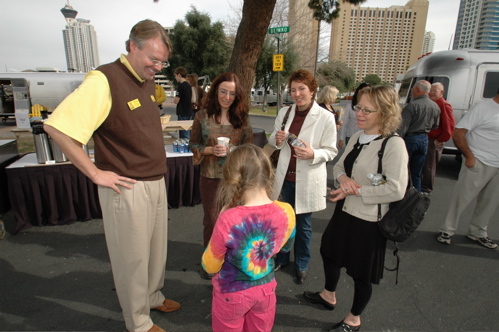 For my part, having been fairly sedentary for the same amount of time, I wasn’t prepared to sit around a few more days just socializing (which is the major activity in Quartzsite, after browsing the flea markets). Weighing our options, we decided to move onward to our final stop in Tempe, and perhaps return to Quartzsite another time. Our stop in Tempe is strictly practical. We are planning some overnight backpacking trips this year and our equipment needs updating. Most of it comes from 1992, when Eleanor and started doing a lot of tent camping. Since this was in the era B.K. (Before Kid) we didn’t have anything for an eight-year-old sidekick, and some of our other items were worn out or had gone missing. Fortunately, Tempe has a good REI store. In fact, Tempe seems to have one of everything, retail-wise. We’ve become bottom-feeders in the retail world, so our reason for hitting REI this week was to see what was left from their January clearance sale. We scored three very lightweight and packable sleeping bags, some boots for me, and a hydration pack for Eleanor. 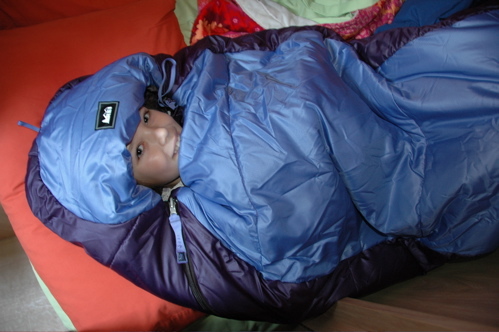 The sleeping bags are rated for 30-35 degrees F, which should be ideal for warm-weather camping. To be sure, we slept in them last night and set the furnace to 50 degrees in the Airstream. 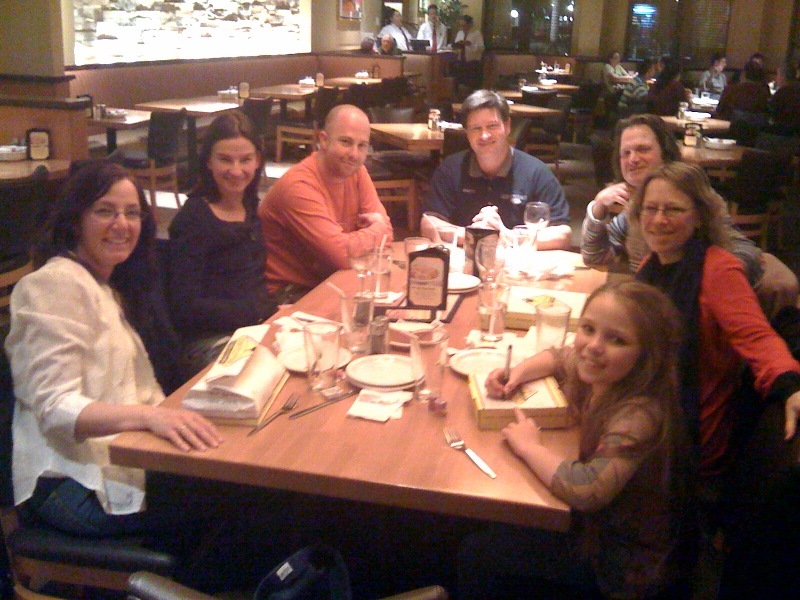 Temperatures went down to the upper 30s outside, so we were at 50 degrees much of the night. I was comfortable, Eleanor needed socks, and Emma was too warm at first. I found her under her regular bedcovers in the early morning, but she gamely climbed back into the sleeping bag and decided it was just right for 50 degrees. We still need a few other things, like boots for Eleanor, and backpacks for Eleanor and Emma, so we’ll finish the shopping at one of Tucson’s local outdoor stores, like Summit Hut. There are other attractions to urban camping in Tempe. We have a friend who lives in his Airstream here, one who we like to visit and who also often has useful business advice. Additionally, there are an enormous number of middle eastern restaurants here. Periodically I need infusions of rogan josh, hummus, and stuffed grape leaves (for health reasons, of course). Poor Eleanor wasn’t up to such foods yet, so she missed out. Tempe has a new light rail line that passes directly in front of this campground and it is very cool. The sage and pewter-colored trains whisk by quietly every few minutes, heading into downtown Phoenix. They are modern and sleek, traveling on all-new track laid down the center of Apache Blvd. I’m told you can ride all day for $2.50. If we had more time, I would definitely take a ride to Phoenix. But alas, time has run out on us. As when we were living in the Airstream, there is never enough time to do everything we want. Emma has doctor’s appointments and karate classes, I’ve got business travel, and we still have a few renovation details in the house that never got quite finalized. A friend is coming for a visit in early February, the giant Tucson gem show will be happening, and then there’s the Florida State Rally, which I plan to fly to. All of that has trumped the Airstream for a while, but we’ll be back to traveling in it as soon as possible. 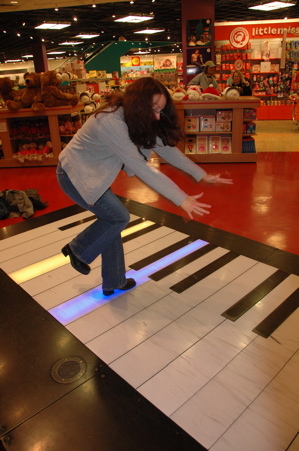 We’re having a great time in Las Vegas. It turns out that everyone here reads Airstream Life magazine! Brett, and Adam & Susan, are staying in the brand-new Airstreams that the KOA Circus Circus has imported. The KOA will be renting these Airstreams for $49/night (introductory price) here in Las Vegas, so at long last, you can actually try an Airstream before you buy one. They’ll also be available at other locations across the country, including Sugarloaf Key Florida, and Bar Harbor Maine. Getting a bunch of Airstreams together is a great way to have a reunion or party, we’ve discovered. It’s like a rally but you don’t need your own Airstream. They even come furnished with linens, towels, dishes, pots & pans, etc. I think they will prove a very popular option. We left Riverside County along I-15 under the threat of the Santa Ana winds. A red flag warning was in effect, and out on the freeway the larger trucks were skittering across the painted lines when particularly heavy gusts struck them. 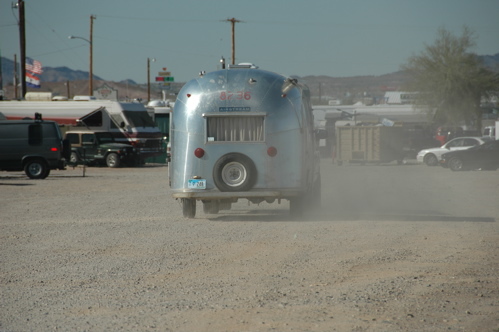 The Airstream was better behaved, but I was still glad to climb up and out of the valley toward Barstow. At Baker we exited the interstate and headed north to Death Valley. It’s a longish drive, and by the time we arrived at Furnace Creek (196 feet below sea level), it was dark. We missed the turn to Sunset Campground and had to wander around for a few minutes before we found it again. The moon, while nearly full, had not yet risen over the Funeral Mountains, and without it, Death Valley can be a very dark place. We found Bert Gildart riding around on a bicycle in the campground, chasing us. He and Janie had seen us roving around, looking for the campground entrance, and Bert decided to attempt to guide us in. They arrived earlier in the day after a narrow escape from Montana snowstorms, and were now settled in for a few days of bone-warming. Sunset Campground is one of three in Furnace Creek area. It’s enormous and so there are lots of spaces available. $12, no hookups, water, bathrooms, and dump station on-site. We are parked close enough to the water and dump that we can conveniently stay as long as we like. About half the people here are using generators for their electrical power, but we and the Gildarts have solar panels. Bert augments his solar collection with a small generator, since his panels have about half the capacity of ours. We are doing fine on solar alone, despite the low sun angle this time of year. Using the catalytic heater instead of the furnace helps. Since we are relying on solar, the first task of the next morning was to clean the panels. Mine were filthy with caked-on dirt, which drastically impedes their ability to generate power. Using Bert’s truck as a ladder, I climbed onto the roof and washed them off, and then Bert did the same on his Airstream. He needed to see me walking around on the roof to be confident that you really can get on the roof of an Airstream (as long as you are careful). We all came here with no agenda. 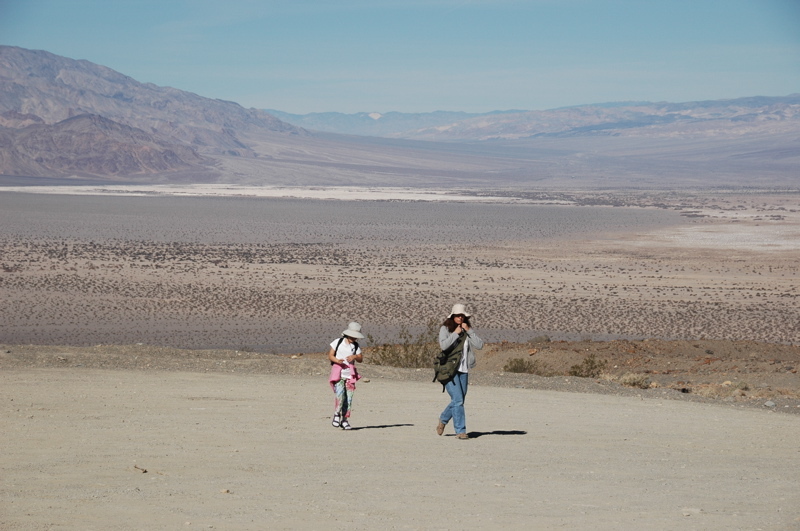 The Gildarts have been here many times, and in fact have written a book on Death Valley, so there’s nothing in this park they haven’t seen before. They are here simply to warm up after weeks of 20-below temperatures in northern Montana. 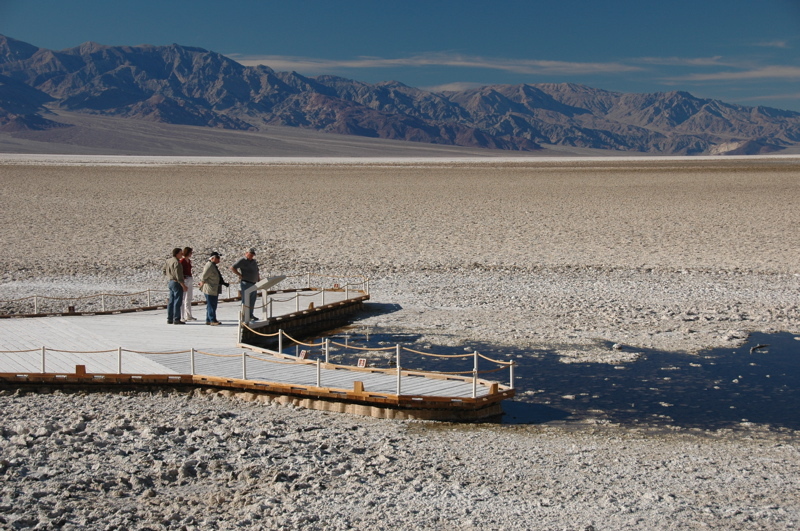 We are here to see them and get some exercise on the trails of Death Valley in the comfortable winter season. It is not hot. The weather this week is pleasantly monotonous: highs in the 70s, lows in the upper 40s, and not a speck of cloud expected. Chance of rain: 0%. 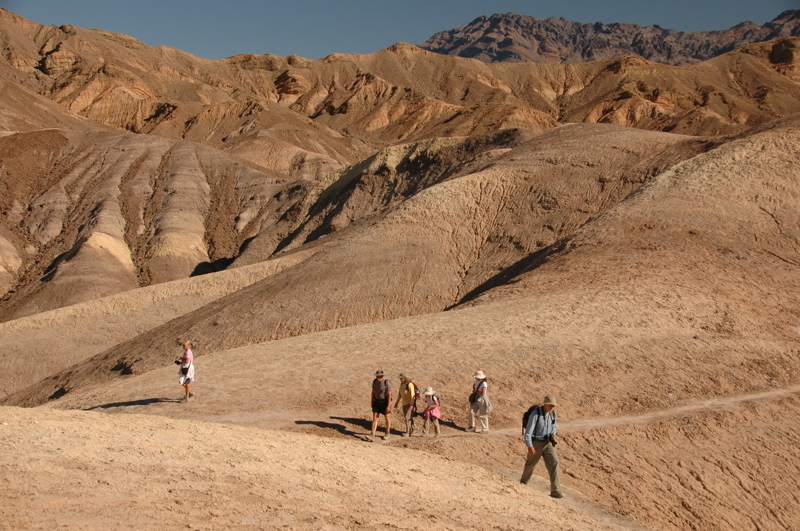 The hot weather for which Death Valley is famous arrives in April, when the average high is 90 degrees, and peaks in July when the average high is 115 degrees. We were once here in June in the Airstream and survived three days with no air conditioning, but it was challenging. This time of year the only challenge is the early sunset, which tends to curtail our activities, so we are getting up with the sun and returning to camp around 5 p.m. This is also a very safe place to be, despite its reputation, especially this time of year. The snakes and other creatures are largely inactive, and the number one cause of death here is the single-car rollover. Because the roads are so wide open (speed limit 55-65 in many places) and there is no traffic, people tend to drive way too fast in their SUVs and Jeeps. Then a curve comes up suddenly and — whoops! — off the road you go. I think the early emigrants who passed through here and lost their lives due to harsh terrain, high heat, and lack of water would find it unbelievable that people are still killing themselves here simply by driving too fast. Cell phones do not work here, and that makes it one of the last major western national parks in that category. We don’t hear cute ringtones going off as we walk the trails. There are usable cell phone signals at Grand Canyon, Yosemite, Yellowstone, Zion, Bryce, and many other “remote” parks, but not here. There is an enforced silence in that regard. I wonder how long the park can hold out. There is wifi, which is how this blog is reaching you. The Visitor Center offers it (oddly enough, only from 10 a.m. to 3 p.m.) and it is also found at the nearby Death Valley Ranch, both for free. In the mornings a small circle of laptop users forms near the General Store, lately wearing warm clothes and hats against the 50-degree chill that persists until 10 a.m. or so. 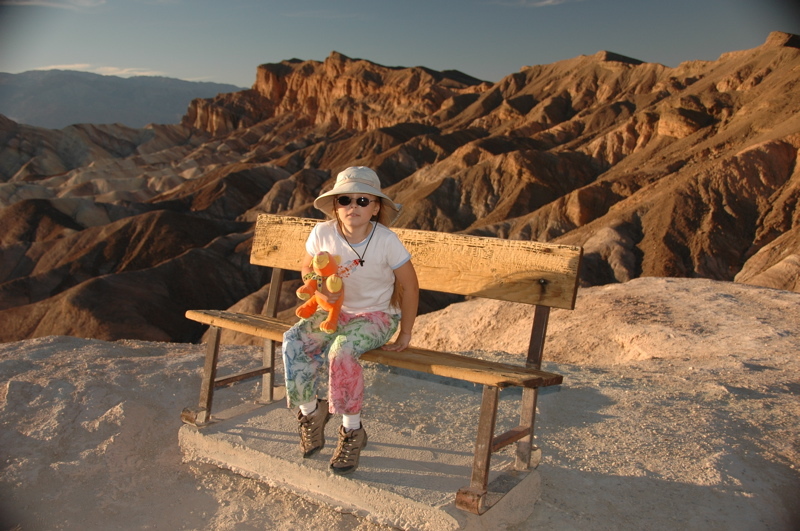 Our travels in the park have so far been to Badwater, Zabriskie Point, Mosaic Canyon, Stovepipe, and the sand dunes. Traveling with Bert, an accomplished photographer, we tend to go places in the late afternoon when the sun is low and details of the desert begin to pop out. Tiny tracks (kitfox, beetle, lizard, sidewinder), ripples in the dunes, colors on the surrounding mountains — all reach their peak of visibility when the sun is low. I will post an album from Death Valley on Flickr as soon as possible, since the photos I am sharing here are only a tiny fraction of what we are seeing.